Stay relaxed and warm all year round! These are top rated space heaters for larger areas. 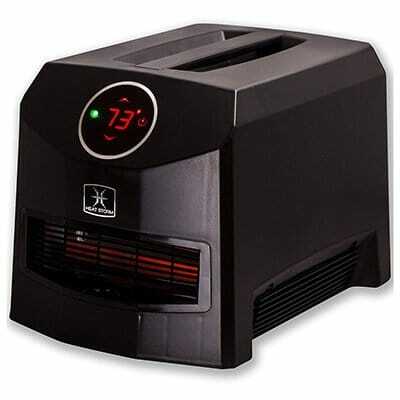 This powerful space heater offers up to 1200 W and can heat large indoor areas up to 1000 sq.ft. 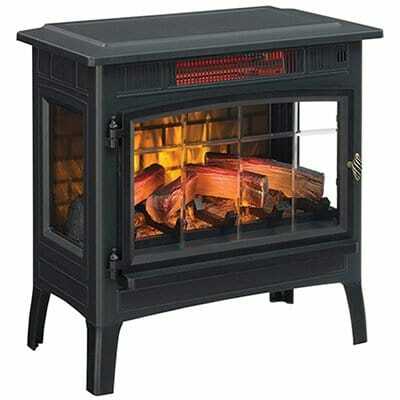 This powerful space heater offers up to 5200 BTU’s and can heat large indoor areas up to 1000 sq.ft. 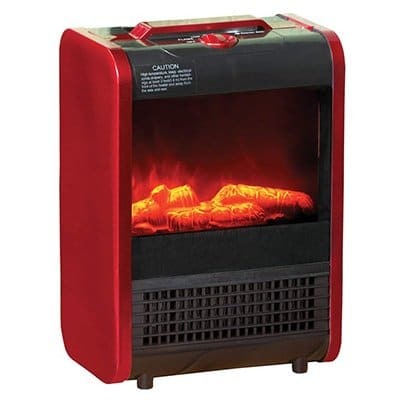 This powerful space heater offers up to 30000 BTU’s and can heat large indoor areas up to 1000 sq.ft. Space heaters are a popular choice for large areas where the main heating source isn’t powerful enough to do the job, or to help offset the cost of heating. They do an efficient job heating an area in a portable and targeted manner. But according to the National Fire Protection Association, space heaters have contributed to 2 out of 5 home heating fires in the United States. This might sound like a scary statistic, but with the proper research and upkeep of your portable space heater, space heaters can be safely and competently used. The aim of this article is to help you choose the right space heater for your needs and the space that you have. Space heaters are portable devices that are used to heat a smaller area within a home, like a living room or office space. Space heaters come in two main types – electric or fuel-powered (propane, natural gas, or kerosene). Electric models work with what is called Joule heating, which is when an electric current travels over a conductor and produces heat. Many electric space heaters will also use a built-in fan to help distribute the heat more evenly in your space. Propane and gas heaters are a popular back-up heating source choice, because they can be run even when your electricity is out. Gas heaters used to have to be fully vented to the outdoors to avoid breathing in carbon monoxide exhaust, but newly to the market are ventless gas space heaters that do not have an air exchange. You can learn more about how these ventless options are safe from this article from Hunker. However, this option is illegal in the state of California and some smaller jurisdictions, so you may want to check and see if they are suitable for your location before purchase. 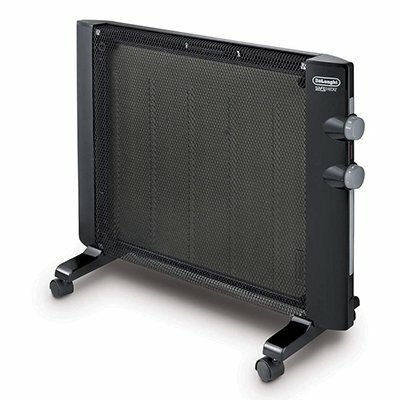 Are Space Heaters Strong Enough for Large Areas? Yes, many space heaters are built to safely heat large areas like living rooms, dens and multi-purpose rooms. Space heaters can make a great addition to your home furnace and can help you save money on your energy bills as well. In larger areas, like warehouses and large community rooms, several space heaters working together might be able to get the job done. To figure out what space heater is best suited to your own situation, read our important considerations below to determine your needs. We have done a lot of research and taken many factors into consideration when choosing the space heaters provided in this article, and we are confident that you will find one suitable to the room you are looking to keep toasty warm. The first thing to consider when purchasing a space heater for a large room is the size and the shape of the room. Measure the length of your room by the width of your room to discover the square footage of the room. For example, 12 ft X 15 ft = 180 square feet. Make sure there is a proper location for the heater that will allow the heat to reach every corner of the room. If the room is open to other rooms (no doorway) you will also need to consider any heat that will be lost through that transition. Ceiling height is another important consideration, because it will be much easier to heat a room with standard 8ft ceilings than a living room with 20ft vaulted ceilings, creating a lot of extra space. If your room has a high ceiling, consider using a ceiling fan on the “clockwise” setting to help push warm air back down into the room and evenly distribute. Another consideration with high ceilings is that because it will take longer to heat the room, you should make sure the heat is put somewhere where you can be comfortable while feeling it directly. Cool air creeping into your home is a very common that many homeowners face. As windows and doors age and the home “settles,” it becomes easier for cold air to sneak in. And if cold air is coming in, chances are your heat is also escaping out. Your best bet with drafty rooms is to address where the cold air is coming from and resolve the issue completely, but sometimes older homes just continue to be cold. If this is the case for your home, consider using a space heater with an oscillating fan to keep the heat moving. Space heaters that are meant for indoor use will often function better within rooms that are well insulated. In general, well insulated rooms will heat up faster and stay warmer longer than say, your garage. That doesn’t mean you can’t use your space heater in your garage, but you might want to consider one with more power for that purpose. Radiator heaters, for example, take quite awhile to warm up to the desired temperature, and if your room is not fully insulated then you may never get to enjoy the full benefits of the lasting heat they provide. Today in the United States, a lot of home appliances have what is called an Energy Star Energy Efficiency Rating. This number tells you on average how much the unit costs to run and how efficient it is in general. The EPA does not currently have Energy Star ratings on home space heaters, but this doesn’t mean that they can’t or won’t save you money on your heating expenses in the long-term. Using a space heater as supplemental heat will allow you to lower the thermostats of your furnace throughout the rest of the house and save you money. Watts are how we measure the flow of energy in electrical appliances, so most of the space heaters we look at in this article are measured in watts. When you look at your utility bill you will see the term kWh, meaning kilowatts. Kilo means one thousand, so if you used your 1,500-watt space heater for one hour, you are using 1,500/1000= 1.5 kWh per hour. Your bill will help you see the local cost for this amount of use, so you can easily estimate future costs. BTUs, on the other hand, are British Thermal Units, and are often used to describe gas-powered appliances. This helpful resource will help you determine how much money your space heater will cost with regular use. You simply put find the type of fuel you are using and how much the fuel costs and match it to the BTUs your unit has. Different levels – Some have two settings (low, high), some have three (low, medium, high). Each of the levels is predetermined within the unit and you will have to play with each to see which suits you best. Once you decide on how big the space for heating is and how much power you need in a space heater, you will still be met with many designs of space heaters and additional features. Some space heaters look like what you would typically expect, but in today’s day and age there is also a wide variety of designer heaters that will complement the décor or any home, and not look like a space heater at all! Our favorite is this Duraflame model that is built to look like an antique wood-burning stove (reviewed below). Additional features include remote controls, manual timers, oscillating fans and hidden controls. This Infrared Quartz Fireplace Stove looks like an antique wood-burning fireplace. It’s aesthetically pleasing and unlike most space heaters, will add to your décor because it’s such a nice piece. Its 3D “flame effect” make it look like a real fire (and you can use this function with or without the heat! ), and the power behind this model will keep you toasty warm. Looks aside, this Duraflame model comes in first place for our best space heater for a large room. It can heat up to 1,000 square feet! It’s probably ideal for heating a room that is between 500 and 750 square feet, but that extra power will make a huge difference in large drafty rooms with high ceilings like many modern living rooms. My favorite feature is that the digital thermostat and knobs are hidden by the fireplace door. From a distance your friends will really think you have an old wood-burning fireplace. With the door open you can easily change the settings with the included remote control, which means less getting up from your Netflix show and more staying cozy on the couch. Duraflame has used a new, “Safer Plug” method on this model that will turn off all functionality if the plug reaches a certain temperature. I also appreciate that it is a cool-touch model, meaning that it’s safe to use around children and pets without too much worry. 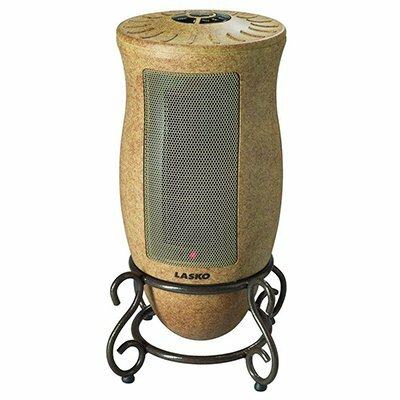 This oscillating ceramic space heater by Lasko looks more like a decor element than a heater with its sturdy pedestal and vase-like design and would make a great addition to any large living area that needs a little extra boost in heat. I love that it has a neutral color that will fit into any home, and that it looks like a heavy-duty structure but weighs just over seven pounds. The controls on this model are crystal-clear and located right on top, making it easy to use. I love the oscillating fan function because it seems to help distribute heat more evenly throughout the room. One thing that is a little misleading about this product is that the pictures fail to show the power cord. This is an electric unit that has a 6-foot power cord. It’s not unsightly, but you won’t be able to put it in the middle of a room like some of the pictures might suggest. I like ceramic heaters because they are good at self-regulating temperature and are better at heating larger areas than space heaters with standard electric coils. This portable ceramic fireplace heater by Collections Etc. is probably best for larger rooms like a living room instead of a bedroom because of how much heat it puts out. The unit comes with two settings (low and high) but most users have found that they became too warm when using it on the high setting! I love the compact design of this model and its bright red color is a bonus for me, because as a mom of three kids I think that it makes it stand out more and not get run over by rambunctious kids running through. If it did get knocked over though, the safety features would automatically turn the unit off. With kids you can never have too many safety features. This space heater also has simulated flames that make it look like a real fireplace. I like this ambient feature and given the affordability of the model it doesn’t seem like you’re paying for more just for the flames. Would recommend! I really wish this DeLonghi Convector Heater had been around when I was living in a chilly apartment in New York City, because whoever designed this incredibly slim and extremely silent unit had apartment dwellers in mind. 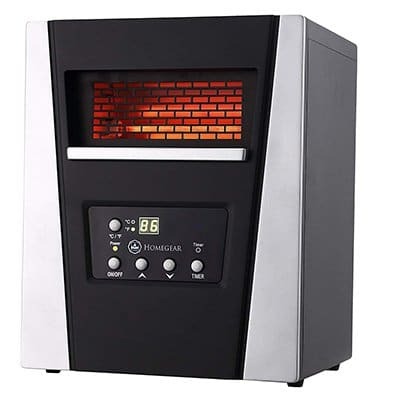 Compared to some of the other models I looked at that claim to heat up to 1,000 feet, this DeLonghi is described as best for rooms up to 300 feet. That figure seemed a little small at first, but 300 feet is still a fairly large room. 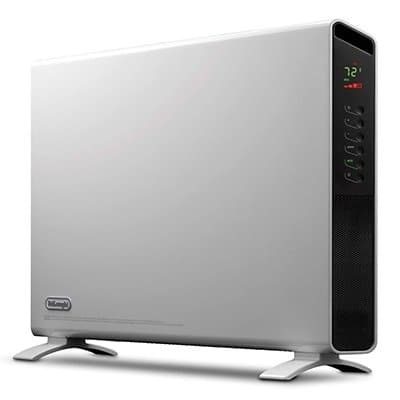 This DeLonghi Heater is only 3 inches wide, and I love that it can be used as either a free-standing unit or a wall-mounted unit (meaning it takes up barely any space at all!) Unlike most space heaters that use one fan, this model has two separate fans that allow the air to come out in three different directions – from the top and from both sides. You can also set it to ECO-function, a built-in feature that will automatically save you energy by changing the temperature to the most economical setting. I love that this PELONIS Electric Radiator looks like a radiator that you would see in an old house or building, but that it still has the very modern features of a digital panel on the front. Because the oil takes awhile to heat up and start radiating heat to an area, this PELONIS model is probably best suited to a room 150 square feet or less or used as supplementing heating to your home furnace. I would not recommend this one for use in an uninsulated room as it will take too long for you to enjoy the benefits. Once it gets going though you will be pleased with how toasty warm your room is. As far as safety features go, being that the unit is filled with oil it weighs just about twenty pounds and would be pretty difficult to knock over, but if you did the unit would turn off automatically. However, if you have children you should be aware that this unit becomes very hot to the touch because of the oil heated inside. This is an expected feature, but little fingers would not be happy to learn this the hard way. Gas heaters are a great option for supplemental heating, because they can always be used as an emergency backup if your power goes out. This ventless space heater by Dyna-Glo would even be a great choice for heating a cabin that isn’t hooked up to electricity at all. Ventless gas heaters are still pretty new to the market, as until recently gas heaters had to have a separate built-in exhaust to the outside. While these ventless options are considered safe, they are not legal everywhere yet (like the state of California). One thing that should be noted about this Dyna-Glo heater is that it will take a bit of setup, preferably by a licensed technician, before you’re able to use the unit. The model is meant to be mounted to the wall and hooked up to an outdoor, 100-pound propane tank. If you have a natural gas line, you can also hook it up to this. Once your heater is properly installed though, you will be pleased with the lasting heat! Baseboard heaters are often overlooked as consumers shop for space heaters, but when used as supplemental heat in conjunction with a furnace, or used separately in smaller rooms, they can provide a great deal of heat. This Cadet baseboard heater is a great choice because it will release heat into the room right where you need it at floor level. Many people choose to use baseboard heaters in smaller areas like bathrooms for additional heat. I like the design of this unit. When installed properly at baseboard level you will hardly know that its there, and for under $50 it is one of the most affordable supplemental heating sources on the market. The only consideration you’ll need to be aware of before purchasing this baseboard unit is that it does not come with a thermostat. You will need to hire an electrician to hardwire the unit within your home with a thermostat for proper use. 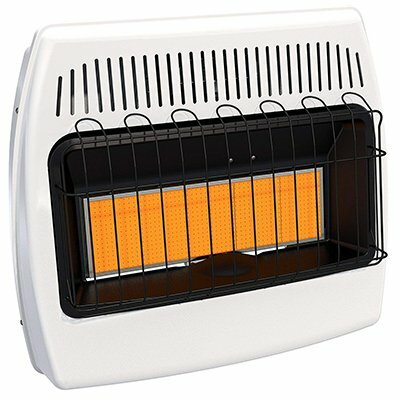 DeLonghi is a company known for their nearly silent space heaters, and this Mica Panel Heater is no exception. The unit is so slim and so hot (literally) that it will easily fit in any room for a reliable heat source. I personally can’t get over how much heat this model puts off for a model that is just about as wide as a flat-screen television. For a closed-off room of about 300 square feet, this space heater will give you plenty of warmth, and larger rooms could easily use two of these units on opposite sides, as they are so quiet you won’t be able to tell if they are on or not! The only general complaint with this DeLonghi space heater is that it requires several hours of “off-gassing” before use. This basically means plugging it in outside or in an open garage where it can run for a couple of hours and burn off the chemical smell from manufacturing. If you skip this very important step during set-up, you’ll be sorry! You might think that this Homegear Space Heater looks more like an industrial model, and you’d be right! This unit is only 22 pounds (which is still pretty solid for a portable space heater) but it will give you industrial-strength heat and has the power to heat up to 1,500 square feet! I highly recommend this Homegear model for extra-large living areas or living areas that are open to other rooms in your home. One of the best features about this model is that the controls are all LED backlit. If you’re like me and like to watch television under blankets and in the dark, you’ll easily be able to see all the controls without having to turn on additional lights. Surprisingly, not many space heaters offer this feature! I also love that it comes with a very simple remote control. I am a big fan of some of the Heat Storm outdoor heaters, and this little indoor guy also does a great job of supplemental heating. Used in addition to your home furnace, this space heater can help with heating up to 1,000 square feet. On its own you would only want it in a small room of 100-200 square feet, but it will still do a decent job. When I first saw this Heat Storm unit, I immediately thought that it resembled a toaster, which is fitting because it will keep you toasty warm! I love that its only 11 pounds and can be easily moved with the carrying handle right on top. The unit runs great on 1,500 watts but can also function at 750 watts in its “Energy Efficient Mode.” This is a great option for smaller rooms or for more targeted heating (like directly on your feet in an office). The term ceramic heater is often misleading because people are expecting a space heater that is made from mostly ceramic, which just isn’t true. Most ceramic space heaters are made from either metal or plastic. The ceramic part is the inside part that heats up when electricity is transferred to it from aluminium fins inside the element. A fan is then used to push the hot air over the ceramic plate out into the room for you to enjoy. Ceramic heaters are newer to the space heater world, and they are a popular choice because they usually provide heat faster than other models. They are also quite affordable to purchase and to run, making them a great choice for heating large rooms. The term “forced air” is used to describe the action of a space heater pushing air over a hot heating element to create warmth in the surrounding area. Ceramic heaters are a type of forced air heater, yes, but typically when a product is advertised as forced air they are talking about a more industrial-strength wind than you would expect for your average indoor heating unit. These forced air units are almost always run on a combustible type fuel (propane, natural gas or kerosene) and are best suited for well ventilated areas, like an outdoor workspace or an open garage. It is not recommended that you use one of these units within your house, as not only would it be a fire hazard but a breathing hazard as well. Sometimes they are called radiant and other times they are called infrared, but the two terms are really one in the same and these space heaters should be described as radiant infrared heaters. They are electric heaters and work by heating either an electric coil or quartz tube. The heat is then transferred out to the consumer as IR, or infrared radiation. It might sound like a dangerous term, but the heat is not! What you will feel will be a lot like the heat that you feel from the sun when it is shining directly on you. These units heat up very fast and are often hot to the touch on the outside. You will feel the most benefits from these heaters if you are sitting nearby them, but they will also do a great job warming a large room. Micathermic heaters and oil filled heaters are both known for their nearly silent operations. Unlike space heaters that are designed to give you quick and hot heat, these units take quite a bit longer to heat larger spaces. They are still recommended for large rooms though, because once they reach their optimal temperatures, they are great at keeping it consistent for long periods of time. 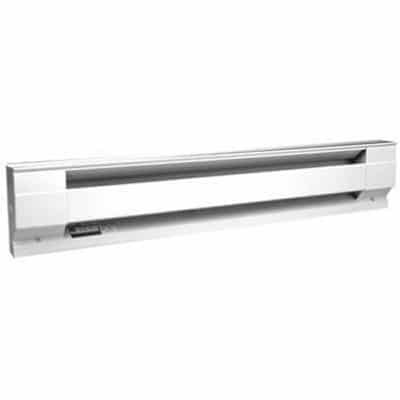 Micathermal heaters are usually thinner panel heaters that can be wall mounted. The electricity works in them by filling super thin sheets of mica, which is actually a type of stone. 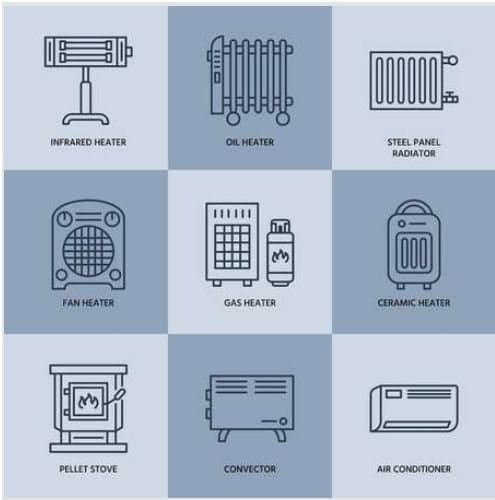 Oil filled heaters do not run on the oil inside of them, rather electricity heats the oil and then pushes the resulting heat out into the room. Oil filled heaters never burn off any oil, so you will never need to worry about replacing it. 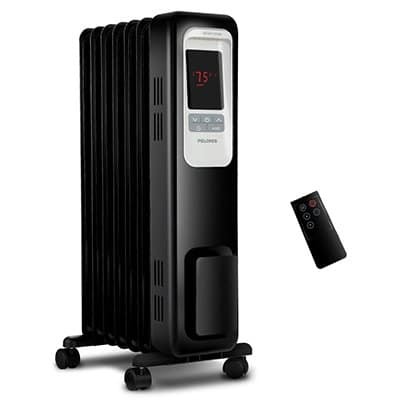 Electric space heaters are by and far the most popular type of space heaters for use indoors. The main reason is because electricity is so readily available and affordable to run. Electric space heaters work by transferring electricity to a heating element (like ceramic, coils or aluminium fins described above) and then pushing the resulting heat out into a room. All of the indoor electric space heaters that we looked at in this article plug in to a standard outlet, making them easy and portable. It’s important to note though, that these space heaters are not meant to run off of an extension cord. Doing so could result in damaging the product or damaging your circuit! There are three types of combustible fuels that run space heaters: propane, natural gas, and kerosene. Sometimes a space heater will be able to run on multiple fuels, so it will be up to preference. Propane is the type of fuel that you would typically buy for your gas-powered grill. It’s a by-product of oil refining and natural gas, and it is stored in tanks in a liquid form. It’s American made and affordable, which makes it a popular choice for use in homes all over the US for heating and cooking. When looking specifically at indoor space heaters that use propane heat, these units are almost always wall mounted (or on the floor next to the wall) because they will need to be hooked up to a 100+ pound tank of propane outside. Why such large tanks? Anything smaller would make the vaporization process of the unit happen too quickly to keep up with the fuel. Propane can be used when the electricity is out, making it a great option for heating large rooms. If your home is connected to a natural gas line, you may be able to hook-up your gas-powered space heater directly to your gas line instead of using a propane tank (which needs refilling from time to time). Natural gas is, as its name implies, a natural resource, and therefore it is a great choice for use as a heating fuel for your large room. Natural gas is often cheaper than propane, but you will have to take into consideration the cost of professional hook-up if you decide to go this route. Kerosene is a liquid fuel that comes from petroleum. Many homes that were built in the late 1800s or early 1900s in the United States had homes that had kerosene lamps and lighting. It’s not as popular today because even though it is less costly than natural gas or propane, it does not burn as cleanly (meaning its worse for the environment) and it is harder to find. Its fumes can be very harmful to your health, so even though there are several indoor kerosene heaters on the market today, we see them as the least attractive option. To find the square footage of a room, simply measure the length of the room and width of the room and multiply the two numbers together. For example, 16ft X 13ft = 208 square feet. When used according to their instructions and routinely cleaned, a properly tended space heater is safe to use in your home. Most contemporary space heaters have built-in features that help to make sure that they don’t overheat and can be used for longer periods of time. However, it is still recommended that you never sleep with a space heater running for your own safety. Multiply 1500W by the number of hours in use. This is figure A. Multiply figure A by your electric rate per kilowatt hour. (You might need to check your electricity bill for this figure.) The sum is figure B.
Divide figure B by 1,000 for your average cost. The short answer is yes. Using a space heater in a large, frequently used room like a family room will allow you to run your main heating source at a cooler temperature in the rest of the house. It will also help you be more energy efficient because you won’t be wasting resources heating rooms that are not in use. We highly recommend this Duraflame model for heating even your largest spaces for a fraction of what an entire home furnace would cost. Space heaters are a great addition to the home heating that you already have and using them supplementally can help you save money and be more energy efficient. This article aims to help you find the best space heater for your large space. Our favorite is the Duraflame DFI-5010-01 Infrared Quartz Fireplace Stove, as it is the highest rated indoor space heater and it looks as stylish while it functions like a pro.